According to the article, this is a ” stock image of an angry female”. Well, here’s the headline: “How women can tell when other females are ovulating using clues in their face – and how they may then try to hide their partners from the ‘threat’ of these fertile ladies” (discovered by reader Ken Steele). I was intrigued because of a stock photo purporting to be an “angry female”, shown above. I thought, is this the best they can do for an “angry female”? Was Hillary Clinton not available that day? No feminists circulating about in the newsroom? Recent research suggests that men find portraits of ovulatory women more attractive than photographs of the same women taken during the luteal phase. Only few studies have investigated whether the same is true for women. The ovulatory phase matters to men because women around ovulation are most likely to conceive, and might matter to women because fertile women might pose a reproductive threat. In addition to choosing the more attractive face, these participants were asked which woman would be more likely to steal their own date. Because gonadal hormones influence competitive behaviour, we also examined whether oestradiol, testosterone and progesterone levels predict women’s choices. The women found neither the late follicular nor the luteal version more attractive. However, naturally cycling women with higher oestradiol levels were more likely to choose the ovulatory woman as the one who would entice their date than women with lower oestradiol levels. 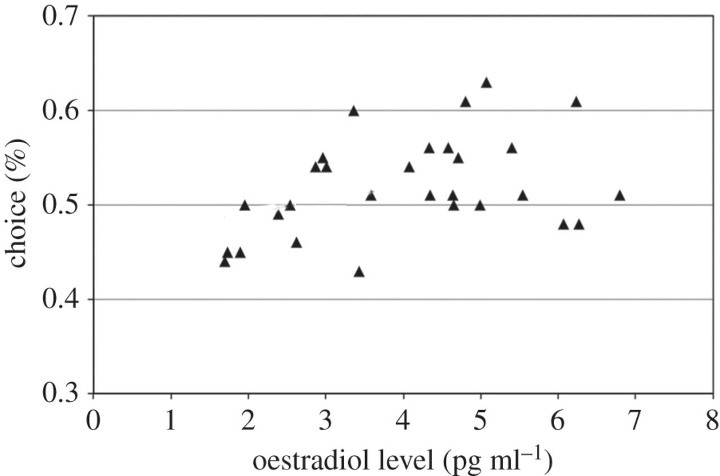 These results imply a role of oestradiol when evaluating other women who are competing for reproduction. The paper opens “Women have been reported to dance and walk, sound, smell and look more attractive during the fertile days of their menstrual cycle. Most of these studies looked exclusively at preferences of men as men directly benefit from ovulation detection in women…” Who knew? There are also clues, subtle and masked, that men find non-ovulating women angrier, especially during a certain phase of a woman’s menstrual cycle. But never mind that. Here’s the picture, slightly modified, of the oestradiol level of the women in the pictures by the percent the participants thought the pictured women would steal their dates. I removed the regression line (via an inexpert use of Gimp) which the authors had. Now consider that if the participants were asked to pick which of a pair of photographs, and there was no real difference in those photographs, the rate would be somewhere around 50% regardless of the level of oestradiol. Is it? Whatever skill women have in picking out competitors (in this sense) based on oestradiol levels of their enemies, it at least isn’t strong. The regression line, which I removed, wasn’t much to look at, either. But it did give a wee p-value, which is defined as a p-value less than the magic number, and which is taken as proof of cause. …men find the ovulatory face more attractive. Such results can be interpreted as men’s ability to detect ‘leaky cues’ to ovulation, serving men in the arms race between women’s effort to conceal ovulation and men’s selective advantage to detect it. Alternatively, men’s preference for ovulatory cues might occur because facial signals of ovulation are identical to what is typically seen as attractive in women’s faces. Isn’t that interesting? It says, scientifically speaking, beauty is objective. That can’t be politically correct. Several more research dollars frittered away. Could have burned them for heat and at least them they would have some value. Even more politically incorrect, ovulating women have been studied and they prefer masculine men during this particular time of the month. So masculine just need to seek out ovulating women and romance will blossom. It says, scientifically speaking, beauty is objective. I think the finding that human attractiveness is more or less objective is not new. Ovulating women stealing dates? Wouldn’t this mean men use clues to find them as well? The first question should be: do men actually find ovulating women more attractive — all other things being equal, of course? Sounds reasonable but do they? Then, too, considering that any given woman is likely to ovulate within the next 30 days, why would this more attractiveness be a factor? If avoiding parenthood is a goal (the market for contraceptives is large) then wouldn’t men tend to shun these women and thus not be “stolen” by them? And effeminate ones at other times? Or perhaps have no particular preference? PC people are so strange. DAV: I’m not sure on the answer to women preferring masculine men during ovulation but maybe not other times. The studies seem to indicate that perhaps women only prefer said masculine men during ovulation, but it’s not totally clear. It’s all about those wee-p values and PC people. You are correct, they are very strange. Our child will be more photogenic if we pick the right date for my photo and your photo to get together. Assimilated? Maybe the gals are just detecting Photoshopping differences. Another good proof for the theory of evolution, I suppose. JMJ, How does this prove evolution? It doesn’t even prove what they say it proves. Women can’t identify other women’s fertile time. In fact, I’d say men theoretically ought to be better at it but without prior information about a female how could they tell? They would have no comparison in order to judge more or less attractiveness they’d just be looking at one rendition. In my view if women have this attitude they’re all keeping quiet about it because I’ve never heard of this before. There’s supposed to be scientific research proving women look at men’s bottoms. It’s no use denying it because science has proved it. So people in the Stone Age already dated frequently enough for this mechanism to provide some evolutionary advantage? Because, you have to be able to see people a couple of times a month, lets say each saturday night. And you have to be allowed to pick your own mate, instead having one forced upon you by the extended families that were the tribes of those age. I note this in the description of the process used to create the images: “It was a shape transformation only, hence the four versions of the same stimulus face differed in shape but not in colour, luminance or skin texture.” But we are all familiar with the colour signals which indicate female sexual readiness and which are presumed to make women more attractive – they’re the basis of the cosmetics industry. And yet the colouration of the faces taken from an anonymous online database were preserved in the “stimulus faces”. And unaccounted for. Still, they got to play with Psychomorph, freely available for non-commercial use. We can all have a go! Sander: Excellent point. I was always told Stone Age males just dragged off the first available female! Rich: It would have taken too much effort to actually photograph women both when ovulating and when not. Could have been interpreted as sexist and gotten a couple of researchers beat up! Of course, it’s also easier and you get to play with fun software, as you noted. Oops-My bad. Study actually agrees, but they did use the same women and photograph them at the same time each day for the menstual cycle, thus eliminating the fun with Photoshop. So, Rich, it seems that it “works” when one uses real faces. Sheri, a very interesting link. I especially liked the observation near the end that maybe it could all be explained by the women tilting their heads forward or back a little. More research needed! With better software! Previous Previous post: On Coincidence And Fortune: Why So Many One-Eyed Generals?